I have been giving lots of thoughts to my tool kit lately. Like many chefs, I have a plethora of knives, forks, cutters, pastry tips, strange new gizmos and the like. My tool kit (if I brought everything with me to the kitchen) would require a two wheel cart to drag it from location to location. Instead, I usually bring a handful of knives in a small tackle box. Unlike some of the young “chefs in training” who have $300 Japanese knives, mine are pretty modest. Keeping an edge on the knife is the only real important factor in determining how well a knife cuts. As I look at this arsenal of cutting equipment it suddenly came to me that the knife without the hand is pretty useless. This made me really start to wonder in amazement at the versatility of the human hand and how it truly is the most important tool in a chefs kit. Just like everything in today’s techno-world, our hands are operated by remote control. The brain is the remote, sending signals to our hands to perform in a certain way. Unlike other parts of the body, the fingers do not contain any muscles. The muscles that make the fingers work are in the palm and forearm. There are 29 major and minor bones in the hand, 29 joints, 123 ligaments, 34 muscles (in the palm and forearm), 48 nerves and 30 arteries, plus, plus. That’s 293 (plus, plus) parts in EACH hand! Pretty complicated. Almost 25% of the motor cortex of the human brain is dedicated to the hands. We have opposable thumbs which allow us to grab and control. Historically it is said that mankind has evolved as a result of our ability to use our thumbs to work in ways that other living creatures cannot. OK, now that we have anatomy out of the way, let’s talk about a chef’s hands. Our hands give us the ability to sense things through touch. Ask any serious bread baker about how he/she mixes the perfect dough and they will talk about the feel of the dough, the feel of the flour, the spring that is felt by the hand after a first or second proof. We snap a string bean to determine it’s freshness, tear at artisan bread, peel an onion, gently shingle cold cuts on a platter with our hands, press a steak on the griddle to determine degree of doneness or pinch an herb between our fingers to release its oils. There is no other kitchen tool that is more important than the hand. A knife can cut, but it cannot interpret. Chef’s have a tendency to take hands for granted. We abuse them daily and still expect them to perform. We typically take better care of our knives than our hands. Over the years, I have accumulated 32 stitches in my right hand alone. I have burned them both numerous times, over-worked them to the point where they would ache, exposed them to frostbite, immersed them in liquids that were way too hot, pulled hot pans out of ovens with wet towels, closed them in refrigerator doors, and even punched a few walls when I was younger and upset with my own performance. Yet, each day, my hands come ready to work. I think that it is time that we give recognition to this great tool that allows us to do what we are passionate about: cook! 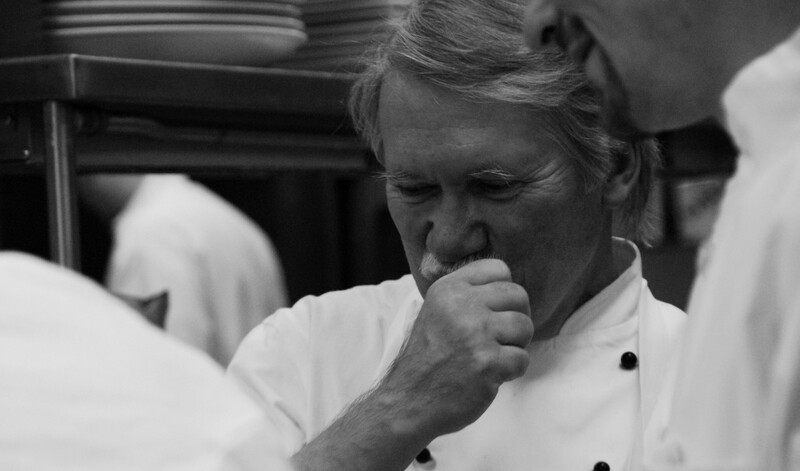 One of these days I am going to put together a photo book of cooks hands. A tribute to the ultimate kitchen tool.